What has changed since yesterday and more recently today? Building UFD from PE1 RAM image is working now. It is mentioned on the log, my apologies.. I am subscribed to the download topic so that I get a message with new updates, perhaps it wouldn't be a bad idea to ping this topic with an update so that more members are aware of new multiPE versions when available. Will try the new version. Unfortunately, so far I haven't succeeded in getting the project to work and I guess many other newbies are getting stuck like me. I am using Windows 7 Ultimate x86 (no SP), with WAIK and using as source a Windows 7 x86 Ultimate. Will try the new version and report back. I tried on win7 x86 Home Premium German with Win7 x86 Enterprise German source. BTW: In version 14 there was a small glitch: When changing from PE1 track to PE2 or PE3 track, there came the wrong error message that with this track WIM Boot is not possible. Do we need to have the WAIK installed? If so, the Vista or Win7 version? These are the details that would be nice to see your project checking and informing users about what is wrong or missing with their configuration. If we get a project capable of diagnosing what is wrong on the user-side, it is already a serious advance to get a stable and good working project. The philosopy is "One Click"
The user has to define the source, clicks "Play" and after a while comes into a running emulator. Installed WAIK, version, etc., are checked in WimToolsEx, and the optimum configuration is choosen automatically. If there is no WAIK, multiPE uses WimCaptEx and loads wimgapi.dll from the source CD. Ok, I am still trying to discover what is wrong. Might have to reinstall Windows from scratch to properly pin down the cause for the project to fail on my host. These are relevant checks, I would impose them as mandatory to reduce the possible errors felt by users. I included an optional check for an interface-defined amount of free bytes. NTFS check is already in the SystemCheck of version 2. There is also a check whether %BaseDir% is under user profile. Why the source should also be NTFS? Spaces do not matter (if they do, there is something wrong in a script). The idea of path length is good, but can you give me a value? There are some winsxs paths which not even fit into a %basedir%="C:"
We should discus a reasonable length for %BaseDir%. If the source is inside a FAT32 partition and you try to mount install.wim, will this work? The idea of path length is good, but can you give me a value? I'd say it would be reasonable to limit the %basedir% path to 100 characters, leaving margin for whatever long file names appear during processing. It is not very propable, that especially this file is accessed from the project. When I looked into a %TargetDir%, the longest path had only 177 characters. Therfore %basedir% max length of 70 is a good choice. 100 is too much. But to be safe at all circumstances, the %baseDir% path length must not exceed 12 characters! Congrats on the new version, I've continued my tests tonight. While testing Leopard from MaxRealQNX, I noted that he provided the link for the most recent WAIK. I decided to uninstall the old WAIK and try out the new one, this solved the WIM handling. Users when looking for WAIK on google will inevitably find the old version instead of the newer one since it uses a very un-intuitive designation as "KB3AIK_EN". Your project would benefit by pointing on the documentation that the most recent WAIK is required and provide the download page. Even better if the project itself is capable of explaining the user that his WAIK is not suitable for handling Windows 7 projects. To make things tough, both the newer and more recent versions use the same install folder. Would be nice to see this documented, warn users to get the latest WAIK and point them on the right direction. The user shouldn't need to restart WinBuilder. The initial scripts should do all the work to configure the project according the source in a way that is invisible to the end-user. I have no idea how you created the multiPE integration and how difficult this request can become, but I mention this to ensure that the "One click" philosophy becomes a strong point on this project. Otherwise users will have to build things from the start and this is a bother. Sorry if I seem picky. I would really like to see this project become stable and user-friendly. Will now try the latest version. Thank you for the update and taking into attention my requests. Will check it during the weekend. When using the 'Auto' options in WimToolsEx, that shold not occur. But there has been a bug which is fixed. When you choose the WAIK option, a messagebox "Wrong ImageX" version occurs. When switched to Vista or Win7, a rebuild of the project tree is necessary. This tree rebuild cannot be done by WinBuilder during process of a project. It can only be done after finishing the process. Therefore the build must be restarted. A restart of WinBuilder is not necessary. I fixed. That was "historical" and contented in one of the very first files by Nightman. Because there is a "Devcon" script contained in the project, the devcon download is totally unnecessary and redundant. I removed it. Would it be possible to set the factory setting to Win7? Nowadays this is the most reachable and popular Windows source. Yes, no need for it. Also, how is one supposed to create a USB pendrive? Last but not least, the presentation of the project could be seriously simplified. If possible, take away from the eyesight whatever is not intended to be tinkered by end-users (using negative values on the script level number) or move inside subfolders to keep the root of the project simple to follow. - PEFactory renamed to "Finish"
These changes contribute seriously to make the project easier to understand from a user perspective. 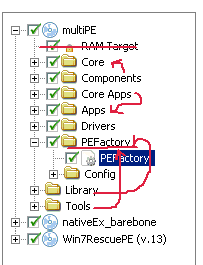 Also, PEfactory is not an intuitive designation and that is the reason why I mention "Finish". This should clearly be defined as the finish steps where some further customization can be found. The "PEfactory" script itself could also use a rename to "Output" or similar name that indicates what it is about. For example, I had to struggle for some time to find out where/how I could create the USB drive from this project. Would never imagine that option to be located inside that script. These two steps increase the user awareness to what they are intended to do. A new upload is running. I cannot reproduce this. But I think it is a WinBuilder issue rather than a multiPE project issue. Can you make a post in the WinBuilder Bug Trecker, too? After a fresh download you do not see the wallpaper script. After defining the source, How do you switch to the Win7 track. execute Tools > WBManager > switch to multiPE_Win7? I know this. But this seemes to be a decision by Billy the Door, more than a glitch of multiPE. In XP I only get "???" cannot be deleted. Then I eiher boot from Macrium Reflect PE2.1 and delete, or change the owner to me, give full access to all files and delete. As I'm told, you also can delete from Linux. Decompress files using 7zip and then packing them up inside a nice VHD? This would be a real progress and solve all these WIM headaches.